The last few months have been plagued by flus and colds which have put us a bit behind on some of our reviews. 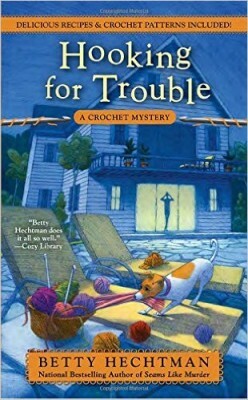 So this week we are playing catch-up and here are some reviews & giveaways of some mysteries from Penguin & Kensington authors from the last 3 months (including one or two from December)-Dangling by a Thread: Mainly Needlepoint Mystery by Lea Wait, Hooking for Trouble: A Crochet Mystery by Betty Hechtman, Saddle Up for Murder: A Carson Stables Mystery by Leigh Hearon, Prose and Cons: A Magical Bookshop Mystery by Amanda Flower, and Death at First Sight: Bay Island Psychic Mystery by Lena Gregory. Details at the end of this post on how to enter to win a copy of all 5 books, along with links you can use to purchase them. Angie Curtis would be satisfied to work on Mainely Needlepoint’s website. She’d agreed to a six month trial and three months have already flown by. Thinking is always easier by the water. As she sips her coffee, a man Angie’s never seen before docks his small boat and walks toward town. Curious and with some spare time, Angie follows to see who he is and where he’s going. That leads to the post office where Dave, the post master, lets the man in, even though it’s an hour before opening time. The man is Jesse Lockhart who lives on one of the nearby islands. He comes to town for supplies every week or so. The Coast Guard checks on him when storms are brewing. Other than that, he is a solitary man. Except for the birds. The King’s Island Cormorants are a threatened species. Jesse considers them to be his birds to protect after he sees teens throwing rocks at the nesting birds. In the meantime, Angie’s friends Patrick and his mother Skye, are back in town. Skye is an actress, studying for a new part. Patrick is recovering from burns he received when his guesthouse burned. Everything has been repaired or replaced, so Patrick is there to stay a while. Skye and Patrick have guests. Gerry and June Bentley own the huge yacht that’s anchored nearby. Gerry says June’s got her heart set on an island home and wants it on King’s Island. He’s a man determined to get what he wants, threatened bird species or not. Jesse and his cousin Simon own the island jointly, inherited from their Grandfather. Jesse pays the taxes and lives there. Simon has no interest in it until the offer to buy comes about. When Angie and the police go to tell Jesse about the offer, they find his body instead. The list of suspects is rather small—Gerry to get the island, Simon to get the money, and townspeople who want to attract the moneyed and build up tourist trade. 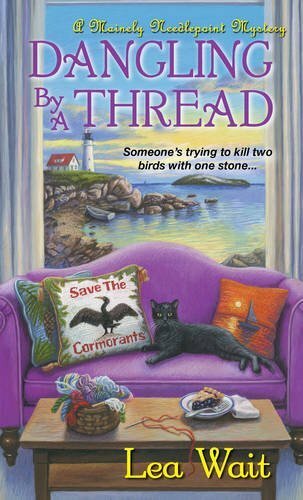 Angie and her needlepointer friends take on a ‘Save the Cormorants’ campaign and try to discover who killed Jesse and why. Readers will enjoy the relationship between Angie and her Grandmother. The obvious love between Grandmother and the Reverend is refreshing to see. The mystery is a good one with enough suspects and good motives. Maine itself becomes one of the characters with Wait’s descriptive passages detailing the weather, the water, and the smell of the fishing boats. Who wouldn’t want to join Angie down at the docks for an early morning cup of coffee? This is book four in the Mainly Needlepoint Mystery series. Hopefully, book five will convince Angie to stay in Maine to sell needlepoint and solve more mysteries. If you remember Adele’s over the top behavior on any given day, multiply that by about a hundred and you’ll have an idea of what’s going on now that her wedding day is getting close. When the venue closes without notice, declares bankruptcy, and there isn’t any money to refund, she’s really a basket case. To add to the stress, she’s teaching a new crochet class at the bookstore and going all out on costumes for the kid’s story times. The new celeb is a woman who certainly knows how to self-promote. Was it a coincidence that the photographers just happened to be on hand when she brought her kids to story hour? Of course not. Mrs. Shedd hopes it will bring more business to the store. Cheyenne and her sisters are hopefully, not a one hit wonder, singing group. They offer to perform at the store. To make matters worse, behind Molly’s formerly (mostly) peaceful house, there’s a McMansion under construction. When out chasing one of her escape-prone cats, Molly sees what looks like a man trying to throw a woman over the balcony. She calls former boyfriend Barry to check into it. He finds nothing. A few days later, there’s a body on the ground, right under the balcony. Barry checks again—nothing. Molly’s sure she’s not losing her mind. The biggest potential problem is that the new neighbor is Cheyenne and her family. To find a body that may or may not exist, prove murder, find who did it, keep the bookstore running smoothly, find a new venue for Adele’s wedding, deal with BFF Dinah’s pre-wedding nerves, and all the rest may prove to be too much for Molly this time around. Look for a nice twist at the end and recipes for homemade granola, double chocolate cookie bars, and a new crochet pattern. This is book eleven—can’t wait to see what happens next! Annie is a horse trainer, one of the best. She also does horse rescue when the police need help with abuse cases. She’s always worked alone, but there is a young woman who just came by to put in an application who gives Annie second thoughts about doing it all herself. When Annie goes to the hay barn, she discovers the woman’s hanging body. Getting turned down for a job isn’t cause for suicide. There are a few inconsistencies too—how did she get a rope up that high and then around her own neck without anything to stand on? Annie has a long distance love interest or at least she would have if circumstances didn’t keep getting in the way. At last, he’s back and closer at hand, if not as close as she would like. Now they can Skype or talk on the phone every night until he’s able to come visit her. There’s a problem with someone camping on Annie’s property and signs of meth, whether usage or making it, young livestock is being killed, and one of Annie’s riding students gets a little too close to the situation for Annie’s comfort. To complicate matters, the murdered woman had worked as a caregiver for an elderly woman who was found dead—by her caregiver and Annie’s half-sister, Lavender, caregiver-in-training. The woman was in her 90s but still, there were medicines gone missing, so was it a natural death or murder? To say more would give away too much of the plot. This is an enjoyable series whether you know anything about horses or not. 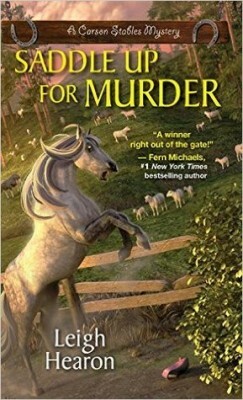 Saddle Up is the second in the Carson Stables Mystery series which promises to get better with each book. Annie is someone you’d like to know, her half-sister Lavender is probably someone you’d like to avoid, Dan the cop a solid investigator with a messy personal life calls for sympathy, and the love interest Annie has makes readers want to know more. It’s time for the annual Food and Wine Festival in Cascade Springs, New York, located close to Niagara Falls. Violet and Daisy, owners of Charming Books, will host a Poe-try reading as members of the writers group, the Red Inkers, take to the podium in costume. It puts quite the damper on the festival when one of the Red Inkers misses her cue. She’s found dead at the bottom of the stairs that lead to Violet’s apartment where she’d changed into her costume. The woman wasn’t very popular, even within the writers group. She felt that she wrote literary books and the rest wrote genre—definitely a step or more down from her lofty words. The store is now a crime scene, but Violet and Daisy are able to bring books outside for a sidewalk sale to keep business going. It’s sad about the dead woman but the festival brings in enough money to cover the town’s businesses during the slow winter months. When the police chief determines the woman was poisoned with nicotine, another Red Inker becomes the suspect. After all, the nicotine smelled like strawberry and was made from an e-cigarette. Guess who secretly had e-cigarettes? Prime suspect indeed, although given the dead woman’s nasty personality, there are a number of suspects. Violet thinks the chief is wrong and sets out to prove her friend’s innocence. That can put her in a bad spot with the chief and a good one with the mayor, a former boyfriend who hopes to become her current boyfriend. A murder is a good way to avoid thinking about it. In the middle of the store is The Tree. It’s rumored that the tree will help customers find just the right book. Violet had her doubts at first but now is a firm believer. The magic of the tree is minimal and doesn’t interfere with the plot, instead becoming a seamless part of the story. Violet and Daisy are a delight as granddaughter and grandmother, although Daisy seems too young for the title. Faulkner, the crow, and Emerson, the cat, add to the charm. Just keep in mind, everybody has a secret. Cass Donovan used to be a psychiatrist in New York City. After a client committed suicide right after their last appointment, she moved to her hometown of Bay Island. Now she has a New Age kind of shop where she does psychic readings. One of her regular clients is Ellie. Ellie is a grown woman, married, and still her mother, Marge, tries to run her life, including warning Cass to stop giving her readings and letting Ellie go back to her controlling husband. Cass did get a bad feeling during their last reading, but it wasn’t anything concrete so she kept it to herself—and then second guessed about it afterwards. When Ellie’s mother is found dead, by Cass no less, the local Sheriff decides Cass is as good a suspect as any for the murder. Cass is helped by good friends Bee and Stephanie, although they can do little to keep Cass out of trouble, like when she decides she has to find Ellie. This leads them to Marge’s house where Cass breaks a window and enters the house. Inside she finds a huge puppy and takes him home with her. Ellie says she doesn’t want the dog, and Cass should keep him but that’s hard to explain to the police. 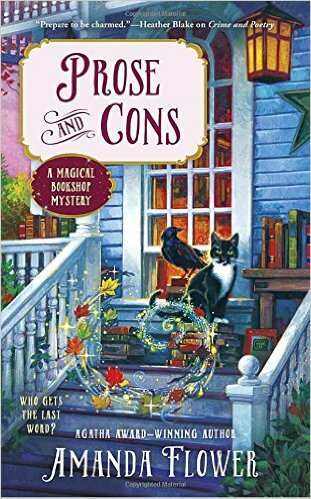 Between running her shop, meeting a mysterious stranger, remembering she now has a puppy who is prone to chewing up entire couches, helping Bee with his fashion show, and trying to figure out who could have killed Marge and why, Cass is kept pretty busy. This is the first in Bay Island Psychic Mystery, a new series. 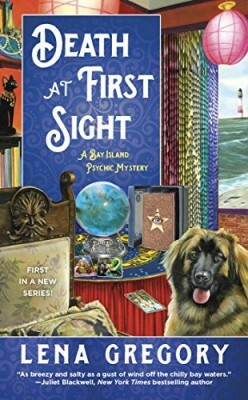 The characters are good with the exception of Cass taking risks even she knows are dangerous, like meeting a suspect at 3 a.m. at a deserted lighthouse. The second book, Occult and Battery, is coming soon, and readers can hope good sense will overcome putting herself into danger. To enter to win a copy of all 5 books, simply email KRL at krlcontests@gmail[dot]com by replacing the [dot] with a period, and with the subject line “end of year,” or comment on this article. A winner will be chosen December 31, 2016. U.S. residents only. If entering via email please include your mailing address, and if via comment please include your email address. I’m happy to find some new authors! These all sound like really good read! Hope I win!!! I enjoyed reading the reviews! Merry Christmas and Happy New Year to all! Thanks to KRL for a wonderful year of reviews and giveaways! Oh what a treat this would be. Merry Christmas to you all. Penguin is just the GREATEST when it comes t publishing cozy mysteries!!!! These all sound like great reads, thanks for the chance to win them. Some of the series I have read & some I haven’t but have on my Wish List! Thank you for your reviews. I have added some of the books to my TBR list (which just keeps getting longer). Have a Happy New Year! 5 new authors. 5 new reads. SSoo hoping. So thrilling. Rhank you for this chance. Thanks for the giveaway…. They look like great reads! I would so love to win these books. These books are exactly what I love to read. Thank you for the chance. I would love to win all of these books. Thanks for the chance to win. Crossing my fingers. Love reading new to me authors. Love Betty Hectman, haven’t read the others yet. Thank you for putting new (new to me) cozy Mystery Authors out there for us!! Sounds like a nice selection of books. I love Lea Wait and Betty Hechtman’s books. I haven’t read the other 3 . . . yet. Fingers crossed. What a great giveaway for some great books.